We all have an inner desire to stop our body clock and look younger. The easiest and the most inexpensive way to do that is, smile. In a recent study conducted it was found that people who smile often appear to be more happy and young. But if your oral health is not up to the mark, it’s not going to work and eventually you are going to appear twice your age. 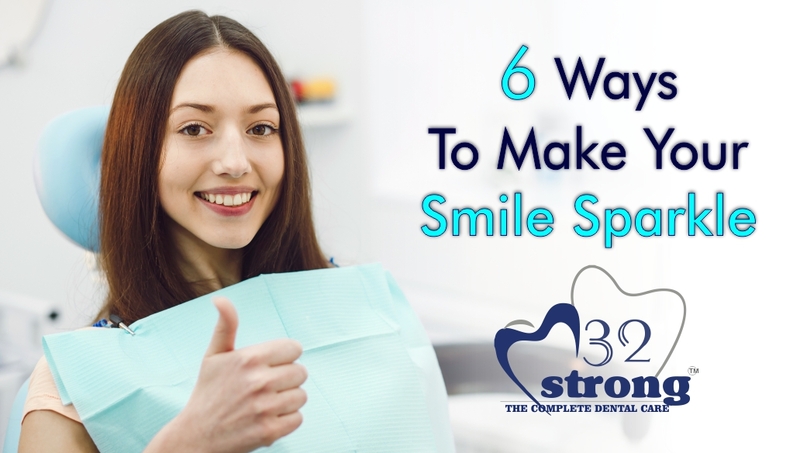 There are many ways to make sure that you have a beautiful and sparkling smile, from choosing the right diet, visiting the dentist to using the correct shade of lipstick – everything reflects directly on your smile. 1. Back to Basics: Follow the basic things like brushing and flossing your teeth at least 2 times in a day, if possible after every meal. Effective brushing includes using a brush that’s comfortable on your hands and mouth and making sure that it has soft bristles. Along with this, using it an angle of 45 degree in small circular motions. Even if people do remember to brush their teeth, they tend to get lazy when it comes to flossing. It is the most effective way to remove plaque and debris from all the corners of the mouth. 2. Get Professional Help: Getting professional teeth whitening from a dentist is a sure shot to get a white sparking smile. They use bleaching elements which use can make your teeth 15 times whiter than DIY whitening products. Even do at home whitening kits are available but make sure you talk to your dentist before using anything on your own. 3. Over the Counter Products: Getting a teeth whitening treatment may be effective but it can be quite expensive for some people. For them, there are many over the counter products are easily available which are effective and easy on the pocket. They come in various forms like strips, gel and toothpaste and are effective to a good extent. 4. Increase Vitamin C and Calcium Intake: The health of your teeth reflects directly on the quality of your smile. Eating a balanced diet makes sure that periodontal diseases don’t come close to your mouth. Calcium, as we all know, is an important factor for maintain strong teeth and bones. Including a lot of calcium rich yet low fat food like cabbage, cheese, bok choy and soya products will give your teeth that extra strength to fight against all kind of bacteria. Just like calcium, vitamin C is equally important in maintaining the oral health. Vitamin C is rich in antioxidants which not only kills the bacteria but repairs the gum as well. Eating vegetables like broccoli will make sure you get enough dose of vitamin C and calcium both. 5. Foods To Be Avoided Strictly: Just like the above mentioned food can help you in maintaining that beautiful smile, there are certain foods that can jeopardize your oral health. Foods like soda (not even diet), hard and sticky candies and junk food like potato chips, are most harmful for teeth. They weaken the enamel and invite the bacteria to start tooth decay. Also drinks like red wine, tea & coffee all are stain causing drinks and they effect the whiteness of the teeth. Even if you consume any of such food items, make sure your brush your teeth as soon as possible. 6. Use The Correct Makeup: Makeup is extremely powerful and if done correctly it can hide all your flaws and make you look perfect. Also it is the least time consuming out of all the tips mentioned above. Using lipstick shades that have a blue undertone and using bronzer so that there is a bigger contrast between the skin tone and teeth. Both these tricks are extremely useful in making sure your teeth look whiter instantly. Like mother Teresa said “every time you smile, it is an action of love, a gift to that person, a beautiful thing.” Smile is an important factor of our personality and following the above mentioned tips, will make sure that your teeth are never yellow or stained and you dazzle the world with your beautiful sparkling smile.